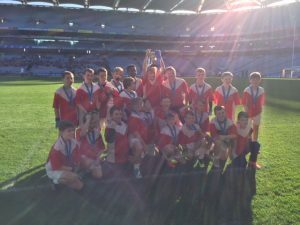 Our school Gaelic Football team won their Final in Croke Park to cue wild celebrations. This win was based on brilliant teamwork, effort, skill and heart. 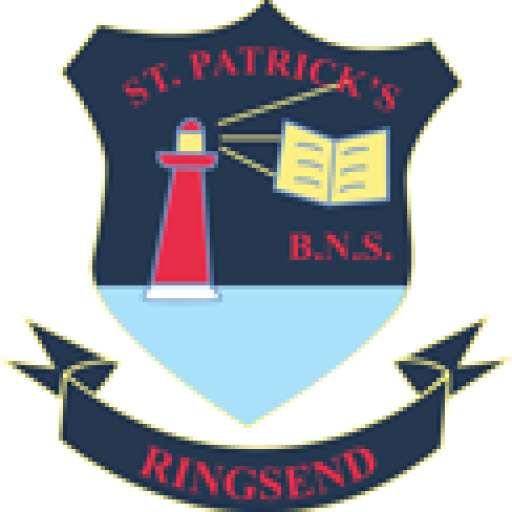 The boys showed great courage to hang on for the victory as they came under huge pressure towards the end versus a strong St Mary’s, Lamb’s Cross team. Daragh was excellent in goal, Murphy a colossus at the back, Lucas an artful dodger in the middle and Luke H an ace poacher up top. Jack B was tenacious in defence, Sean a pest all over the park and Darragh a brilliant ball carrier. Cameron and Stephen attacked with aplomb and scrapped for every ball. Brandon, Daniel and Jamie tackled like demons, Jack O’S popped over a beauty and Jason and Luke C ran themselves into the ground. Joe, Craig and Harry got a run-out on the hallowed turf, as would Sean DM have done if the referee had not blown up early. Calum got the winning goal and then there was Josh; just the 2-4 from centre-half-back. When he hits the ball it stays hit! It was a wonderful win and one the boys will never forget in the sunshine in Croker. Well done boys. You made us very proud.